The mushroom is just one of a very large, diverse group of organisms called fungi. It is similar to a plant but lacks chlorophyll, so they cannot produce food for themselves through photosynthesis. The mushroom is a decomposer that absorbs nutrients from materials such as compost, leaves, decaying wood, and soil. There are many types of mushrooms, varying in size, shape and color, with surfaces that range from smooth and silky to pitted and honeycombed. 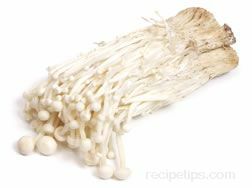 The most common and readily available are the cultivated white mushrooms, which have a mild flavor and can be used in many types of dishes. Wild mushrooms, such as chanterelle, morel, shiitake, portobello and oyster, will provide a more intense and exotic flavor. Generally, mushrooms contain 90 percent water and have few calories. The fat and carbohydrate content is minimal and they do not contain any cholesterol. They are rich in protein and contain vitamins such as B, C and D, while a few contain vitamin A. Be aware that some of the vitamin values are destroyed during the cooking process. Mushrooms can be fried, sautéed, or stir-fried on their own and eaten as a side dish or used to top an entrée. Mushrooms are also popular as an ingredient in salads, soups, sauces stir-fries, meat dishes, and other main dishes. Cultivated mushrooms, such as portobello, shiitake, cremini, and oyster, are available year-round. The wild mushrooms are available during their seasonal times, such as morels that are available in the spring, chanterelles in mid-summer, and porcini in the fall. Dried mushrooms are available all year-round. When selecting, choose mushrooms that are firm, fresh and free of blemishes. Check underneath their caps for tightly closed brown gills and be sure the surface of the cap is not dried and woody on the edges. Also look for slimy or sticky surfaces and for any coloring that is not normal. 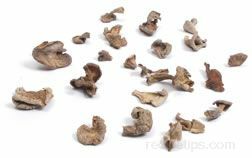 When buying dried mushrooms, check the package and if they are crushed into little pieces, do not buy them. Look for packages containing large pieces. To know what quantity of dried mushrooms to purchase, figure that two ounces will equal approximately one pound of fresh mushrooms. 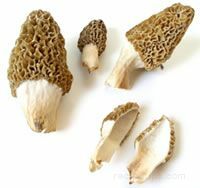 A variety of mushrooms that are not cultivated commercially, but are gathered in the wild such as morel and chanterelle varieties. Care must be taken when harvesting wild mushrooms because there are many poisonous varieties that have the same appearance as edible mushrooms. Also referred to as the Field Blewit or at times confused with the Wood Blewit, this variety of mushroom is readily identified by the blue to purplish-blue streaked coloring of its stem. Topped with a smooth, light tan or light brownish colored cap that ranges in size from 2 to 5 inches in diameter, the Blue Leg mushroom emits a pleasant aroma from its dense white flesh, which begins to darken when it ages. As a wild mushroom, this species may be referred to as the Blewitt, while the Blue Leg or Bluefoot (a.k.a. Blue Foot, Bluey, and Bluebutton) name is used to describe the larger, cultivated version of the mushroom. A variety of mushroom that includes over 100 different species, most edible but also some are poisonous. The boletus mushrooms are often identified by their olive to brown colored spore prints (similar to fingerprinting, spore prints are used as an identification method of capturing a spore appearance), their dense and solid stems, and their round-formed cap. Some of the common varieties include the bay boletus, the birch boletus and the red-cracked boletus. A few species of the boletus mushrooms become very soft or mushy when cooked, so it is wise to test the variety selected with the intended cooking or preparation methods before serving. A small, white mushroom with a mild taste, which is one of the most commonly used mushrooms in salads, soups, and main dishes. 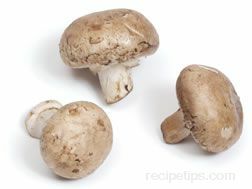 A variety of mushroom that is similar in size and shape to a button mushroom, but has a brown skin and a creamy tan flesh. The flavor is much more pronounced than button mushrooms. Also known as crimini. 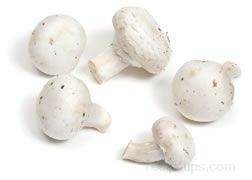 A white mushroom with a mild flavor that is very much like a button mushroom only larger. They are grown commercially and are easy to find in supermarkets. A mushroom commonly found growing on tree trunks or tree roots. It grows in long clusters of string-like stems with small white caps. It has a mild flavor and a texture that is somewhat crunchy. It is a good addition to salads, soups, meat dishes, and as a garnish. The spongy base should be removed before using. Also known as the "snow puff" and "velvet foot" mushroom. Orange in color, the name for this variety of mushroom is derived from its coloring that is similar to a lobster with the burnt orange outside and white inner meat. Firm and chewy in texture, this mushroom provides a somewhat salty, delicate flavor. Often referred to as a parasite, the Lobster mushroom lives off the nutrients provided to other fungi as its host, most often living off Russula or Lactarius mushrooms. Although the Lobster mushroom most often does not live off poisonous varieties as hosts, it may do so at times, depending on the area in which it grows. Therefore, care should be taken to make sure surrounding mushrooms that are host to the Lobster mushroom are not of the poisonous variety. As it grows, an irregular shaped cap forms above the stem, developing into many different shapes with many different sizes. An Asian fan-shaped mushroom that is white, light gray, light gray with a bluish tinge, pale yellow or pinkish in color. It has a slight odor similar to anise or licorice and a tender texture with a mild oyster-like flavor. They can be stir-fried, deep-fat fried, braised or sautéed. They are good in casseroles, or cooked with fish or chicken. Oyster mushrooms are available throughout the year in Asian markets and specialty produce stores. Also known as Pleurotte mushrooms and Shellfish mushrooms. A rich meaty flavored mushroom that has a large, round cap that is pale yellowish brown to dark reddish brown in color and grows 2 to 8 inches in width. They grow on the ground under conifers and hardwood trees in the North American woods. The cap and stem have a firm, thick, white flesh with a distinctive and assertive flavor and is excellent used in soups, sauces, stuffing, fish and other dishes. They are available fresh, frozen and dried and can be broiled, sautéed, stewed or baked. When dried, the porcini mushroom is available throughout the year but when fresh, they are only available June to November. Also known as cepes and stone mushrooms. A rich flavored, meaty textured Italian mushroom, which has a large, flat, dark brown caps that grow up to 5 inches in diameter. Delicious when grilled, broiled, or sautéed. These are available from December to March. This mushroom may also be referred to as a Portobella mushroom or as a Bella or Baby Bella mushroom. A round, white or grayish-tan colored mushroom that grows or "puffs up" into the shape of a round ball. Growing without a stem or gills, the Giant Puffball may be somewhat small in size reaching 4 to 6 ounces or grow to a size of 20 to 40 pounds exceeding 2 to 3 feet in diameter. Slightly nutty flavored, the Puffball has a bright white inner meat with a dense and firm texture that should not tear when cut cleanly with a knife. If the flesh is discolored (yellowed or brown), does not cut cleanly or contains evidence of excessive moisture, avoid using the Puffball. Before eating, always cut open the Puffball to make sure it contains only a consistently dense flesh without features such as gills, a stem or a cap beginning to form. Since small varieties of Puffball mushrooms can be confused for other poisonous varieties such as "Amanitas" or "Amanitaceae" when they are very young it is always important to cut open the mushroom to check for gills. The Small Puffball contains no gills, but on the outside closely resembles the Amanita. As the Puffball mushrooms mature and dry their color changes from white to yellow and then brown on the outside with a powdery collection of dark brown spores on the inside. An Asian mushroom with a pale brown to dark reddish brown cap that is generally two to four inches wide. The young mushrooms have an edge rolled inward, which nearly flattens out with age. The stems are tough and fibrous and are generally detached and discarded. The cap has creamy white gills on its underside and its flesh is firm and white. The mushroom grows in clusters on hardwood, such as oak, chestnut and beech. The flesh is meaty textured with a rich, smoky flavor and goes well with all foods. The shiitake can be sautéed, baked or broiled and can be used in soups, casseroles, sauces, in stuffing for poultry or fish and eaten on their own. Shiitake mushrooms are available fresh and dried. Shiitake mushrooms are also known as Japanese black mushrooms. A type of mushroom that resembles a large ear when it is fresh and grows as large as half a foot. The surface of the mushroom is purplish-gray in color and the flesh is a dark purplish gray to almost black in color. It has very little flavor, but is used mainly for its firm, gelatinous texture and for the color. With a firm, almost rubbery texture, it may be best to slice it into small bits in order to make it more easily chewed and digested. The mushroom is available both fresh and dried. The Wood Ear mushroom is also known as a Judas' Ear and Tree Ear mushroom. A common mushroom that grows in large groups in wooded areas and damp places. They are characterized by dark brown caps that measure up to two inches across and brownish-yellow stems. The underside of the cap features narrow veins rather than gills. Yellow leg mushrooms have a pleasant aroma but are very bitter if eaten raw. They are best when added to dishes that are slow cooked which makes them tender and much more flavorful. They will stay fresh in the refrigerator for up to a week and they are very easy to dry. Do not prepare mushrooms until just before using. When cleaning mushrooms, avoid using water because it will reduce the flavor. Mushrooms are easily saturated with water and tend to become mushy if soaked. Use a soft brush to clean sand, grit and other debris from the pits and ridges. If you must use water, use as little as possible and dry quickly with a paper towel. Cultivate mushrooms will require less cleaning than wild mushrooms because they are grown in a controlled environment in sawdust, dirt, and other coarse mediums. Most of the dirt will only be surface dirt and generally only require a dusting or wiping off with a damp paper towel. Wild mushrooms require a little more cleaning because of the environment they are exposed to. Start by using a soft brush to brush away sand, dirt and other debris. Use a damp paper towel to wipe off anything that could not be brushed off. If the mushroom has a hollow stem or cavity, split the mushroom lengthwise and check for additional sand, dirt, and insects that may be trapped in this area and clean if necessary. After cleaning the mushroom in this manner, if there is still debris on the mushroom, you will have to rinse them with water. Place mushrooms in a colander and use gentle running water or a spray nozzle to rinse. Rub lightly with fingers if necessary to remove particles. Rinse as little as possible, drain well, and then spread out on a paper towel and pat dry immediately. To reconstitute dried mushrooms, soak in hot water or chicken broth for approximately 30 minutes. Use a fine sieve lined with paper towels or cheesecloth to drain the liquid from the mushrooms. The liquid can be saved to use as stock for soups and sauces. If there is sand or grit still remaining, rinse and drain the mushrooms again. If the dried mushrooms are going to be added to a soup, they do not need to be reconstituted first. Mushrooms can be used whole but are most often sliced or chopped before cooking. Only the cap of some mushrooms should be eaten. To remove the stem, trim the stem off with the tip of a knife or twist the stem to separate it from the cap. To slice mushrooms, use a sharp knife and begin cutting slices parallel to the stem of the mushroom to the desired thickness. To chop mushrooms, slice mushrooms parallel to the stem and the cut slices into strips. Cut strips into desired size pieces. Use a food processor to slice or chop large quantities. Slice off the stem of a whole, clean, mushroom. 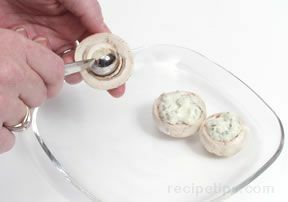 With a small teaspoon (1/8 or 1/4 teaspoon), or small melon baller, scoop out the inside of the mushroom. Fill with prepared stuffing or favorite dip. Slice mushrooms, place in a pan, add a bottle of Worcestershire Sauce (see definition below) and a stick of butter. Place pan on grill or on stove. Allow mushroom mixture to heat/sauté while cooking your main meal. This is a simple mushroom sauce that tastes great on steak and other favorite meats. Mushrooms can be sautéed, broiled, fried, or eaten raw. Wild mushrooms require longer cooking times than store bought mushrooms. Aluminum pans tend to turn mushrooms black, so avoid using this type of pan when cooking. When picking wild mushrooms, research the type of mushroom you intend to consume. 1-2% of mushroom species are poisonous.